Bida Nok is the larger of two limestone cliff islet with similar topography to Bida Nai and again directly South of Phi Phi Leh. 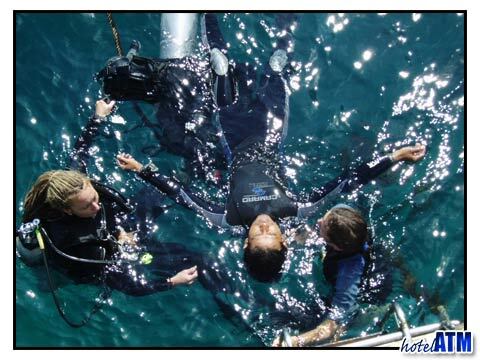 Bida Nok and Bida Noi are separate dives but most commonly these two dives are made on the same day trip. 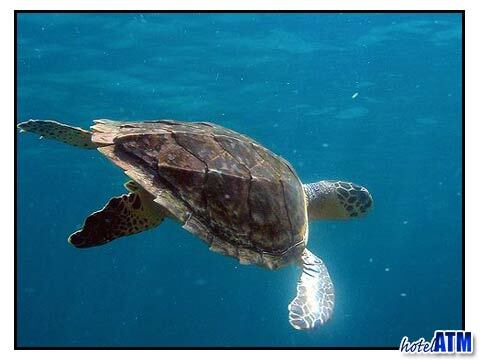 Your dive generally begins just outside a large sheltered bay abundant with beautiful coral bommies and rock formations scattered across the sandy bottom, favored by banded sea snakes and hawksbill turtles. The cliffs of Bida Nok descend straight into the sea to around 30 meters and it’s walls are covered with soft corals and colourful purple, green, blue and pink anemones, creating a magical wall dive. Looking closely between the crevices and zigzag clams for moray eels, most commonly the white-eyed moray, nudibranch of all sizes and types (look for the yellow circular egg sack and you’ll find nudibrach close by). Keen eyes will also be able to find seahorses commonly found sheltered near outcrops of sea fans. Schools of fish swarm up and down in all directions all around you and caverns and overhangs are aplenty. Jumbled boulders create a small swim-through on the south side, which as usual is deceptively hidden by schools of Glassfish, also Hawksbill turtles are usually seen munching coral in this section of the dive. With a beautifully diverse Finger Reef full of gorgonian sea fans, sea whips, giant brain corals, table corals and bubble coral. Several species of Pipe Fish are also common here, as are many kinds of lionfish, bearded scorpionfish, bird wrasse and moon wrasse, parrotfish, moorish idols and honeycomb grouper who also call this home. Leopard sharks are very common all around Bida Nok and Black Tip Reef Sharks are also frequently seen on the north side. Due to the enormous diversity it’s a favorite amongst photographers. A lucky few (very lucky few) have also seen Manta Rays and Whale sharks here, although these sightings are extremely rare. If you’re looking for Manta rays and Whale Sharks and have advanced open water training you’re better of taking one of the trips to Hin Deang / Hin Muang or even a livaboard out to Richelieu Rock and Koh Bon these sites provide the most frequented sightings (although there are never any guarantees).